Our request is simple: City and State elected officials must equitably fund Baltimore's public schools. In the midst of the worst city school budget crisis in 15 years, we will “March Forth on March 4th,” during a march on 3/4/2017 at the Inner Harbor. As Baltimore City Public Schools’ (BCPS) leaders grapple with the worst budget crisis in 15 years, DBFA is calling upon Maryland Governor Larry Hogan to release $130M from the supplemental budget to fund the shortfall. DBFA is organizing thousands of city families to push the Governor to “#FixtheGap” while BCPS works with its state and local partners to solve a structural deficit decades in the making. 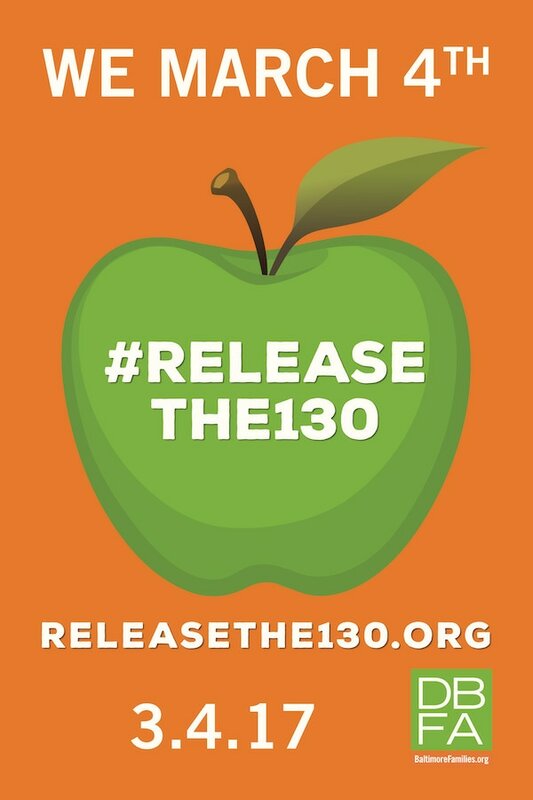 ​#Releasethe130 calls attention to the shortfall’s drastic consequences in very real and solid terms. DBFA is collecting stories from students, parents and teachers highlighting the impact of the shortfall. More than 1,000 families will “march forth on March 4th” to demand the supplemental budget to be released, during a press rally and march at the Inner Harbor. The collected stories will be displayed during the event, and delivered directly to Governor Hogan. We need to make sure our Governor understands that this is not a hypothetical problem. These are not just Baltimore’s children, they are Maryland’s children. Real kids, in real classrooms, with very real futures that we cannot play politics with. The $129M shortfall is going to effect every single school, and lead to 1,000 layoffs of support staff and teachers. It's important to note that the shortfall is NOT a failure on the part of City Schools' leadership or financial management- it's a structural deficit. Next year we take on the fight to fix the funding formula for good. In the meantime, Governor Hogan must ensure BCPS has the necessary support to come through this challenging process without sustaining further enrollment losses. How can I help #FixtheGap? Getting city leaders and the governor to take notice is going to take ALL OF US spreading the word through our friends, coworkers, PTOs, and social media. Share why your school is counting on Gov. Hogan to #FixtheGap on social media and use the #FixtheGap hashtag. Start talking with your friends and within your schools and faith communities. Make your voice heard! ​ March 4th Rally at Rash Field, Inner Harbor: Thousands of families from across the city will demand that the $130M be released to fund City Schools’ budget. Hang #FixtheGap signs outside your school and/or in your windows at home. Signs are free and available for pickup at your school on Feb. 15th. Take photos of students, teachers and families with the signs and upload them to social media using the hashtag #FixtheGap. We've heard growing concerns from parents about city schools long term sustainability following BCPS CEO Dr. Sonja Santelises’ announcement of the budget shortfall. DBFA's mission centers around keeping families in the city. Middle-class flight has led to Baltimore becoming one of the most racially segregated cities in the county, and has undermined the city's financial sustainability. This has had disastrous consequences for the school system. In addition to offering a pragmatic solution to the shortfall by pushing city and state leaders to #FixtheGap, the campaign is reassuring families that they are not alone in their concerns about the budget gap. We're all in the fight to make sure families can count on the public schools for a great education. Families opting-out of the system leads to further budget shortfalls, as state funding is determined in part by the number of students enrolled in BCPS. Between $25-27M of the current shortfall stems from a drop in enrollment. Downtown schools and schools bordering waterfront communities serve some of the most racially and socioeconomically diverse student populations. These communities represent successful examples of integration in one of the nation’s most segregated school systems. Families leaving the city poses a serious threat to efforts to diversify our schools, a growing concern in light of recent research highlighting the impact of socioeconomic segregation on the achievement gap. Get Apple Story Sheets and Instructions here!